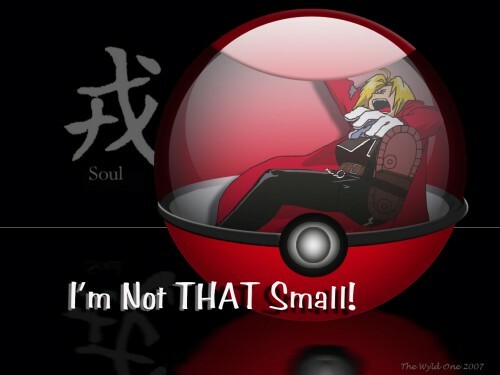 Fullmetal Alchemist Wallpaper: I'm Not THAT Small! Minitokyo »	Fullmetal Alchemist Wallpapers » Fullmetal Alchemist Wallpaper: I'm Not THAT Small! Well, I was playing around in PS trying to learn this snow globe thing and trying to figure what to put in it without it being wintery or snowy. I wasn't aiming for glitz or anything showy, just tried to focus on the humor part of the wallie. But where did the character "soul" come from anyway? Actually, I just thought it was a fitting symbol to kind of represent the story where the main journey of the story is trying to get Al's soul back to it's original body, (at least Ed's mission lol, as Al is always more concerned about getting Ed's leg and arm back). Love pokemon too, and FMA just ROCKS! WHO YOU CALLIN A RUNT SO SMALL HE CAN ONLY BE SEEN WITH A MAGNEFYING GLASS?!?!?!?! he fits in a poke-ball! It's so brilliant you really have too much imagination! haha~ this wall is so interesting !